On my virtual travels around the interwebs today, I came across what may be the greatest RV vent upgrade that I have ever seen. It’s a weather resistant ultra vent with a built-in fan that even works in the rain. How’s that for kicking it up a notch. It’s called the TurboMaxx and it’s made by MaxxAir. This fan is a terrific way to improve the functionality of your ventilation system and it’s incredibly easy to install. One thing that I really dislike about owning an RV (travel trailer in my case) is the roof vents. Don’t get me wrong, they are very handy things to have. It’s nice to be able to crack them and let some air circulate. I especially like the one in the bathroom with the fan built-in. Wait a minute, didn’t I just say I dislike the vents, then contradicted myself by talking about all of the things I like about them? I did. I guess that the part that I dislike isn’t so much about the vent as it is my memory. I have a terrible memory and I often forget to close the roof vents. This is very problematic when a rain storm blows in or when I am hooking up the trailer for towing. I keep waiting for the day that I arrive at my destination and find that my vents have been ripped off because I forgot to close them. 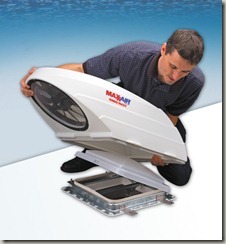 Enter the TurboMaxx vent fan from MaxxAir. The miracle of modern engineering installs overtop of your existing vent and offers a unique angled design that allows air to flow easily – even on a rainy day! 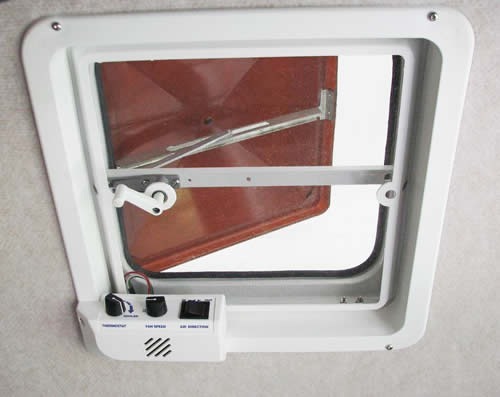 This unit is fitted with a 3 speed fan that allows you to intake fresh air, or vent exhaust. The powerful 4 amp motor and 12” (that’s twelve inches! ), 10 blade fan will easily remove odors or smoke and is great at preventing heat build-up. If you add on the thermostat option, you can even set it and forget it. 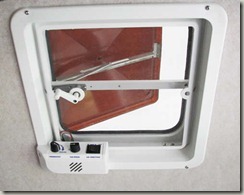 To install this RV wonder fan, you simply attach it directly overtop of your existing 14” x 14” standard exhaust vent. With MaxxAir’s exclusive Zero-Leak mounting system, you don’t have to worry about any accidental flooding. It won’t block out the light either! The translucent white rain cover is made of ultra-strong polyethylene with UV protection, so it will last for a very long time. A two year limited warranty. Externally mounted fan and motor for quiet operation. A 3 speed fan (available with or without thermostat). Easy installation – it fits over your existing roof vent and there are no holes to drill. If you have one of these fans, let us know your thoughts on it in the comments.